I know you’ve been anticipating the July 2016 rural photo shoot. Here it is! July 2016 rural photo shoot was CRAZY. I was completely out of my element. In a brand new location, a huge rush to shoot, and super excited kiddos were the biggest reasons I didn’t capture very many quality photos. But, quality is better than quantity, right? So, I did get a few good ones that will make long lasting memories of this whirlwind wedding weekend halfway across the country. Yes, I actually packed my family onto their first air plane ride for this month’s photo shoot. And let me tell you, the results I did capture are simply breathtaking. 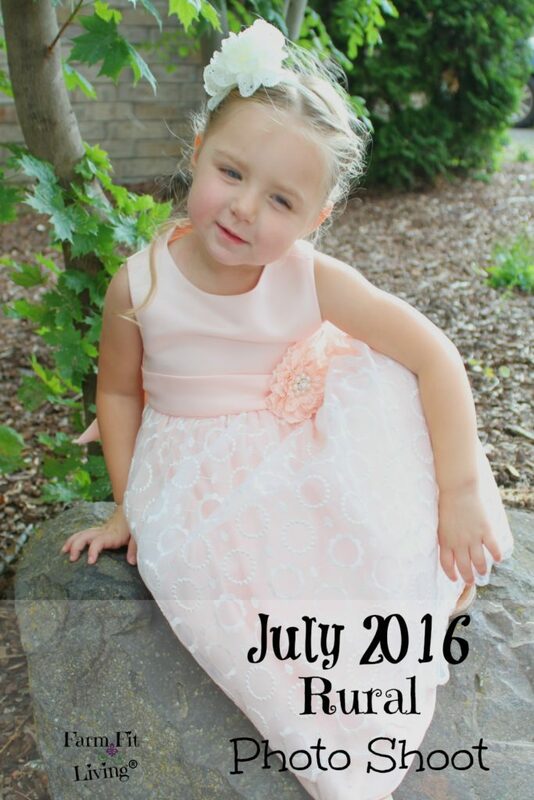 I’m excited to share with you the results of the July 2016 rural photo shoot. While every photo shoot in this challenge will be completely different in every way, this photo shoot was unlike any other. None of us had ever been to this location before. My girls had never even been on a plane before! I wanted them to remember them. I can barely remember my first plane ride to Philadelphia when I was Mylee’s age. So, I definitely wanted to capture this moment for both of my girls. 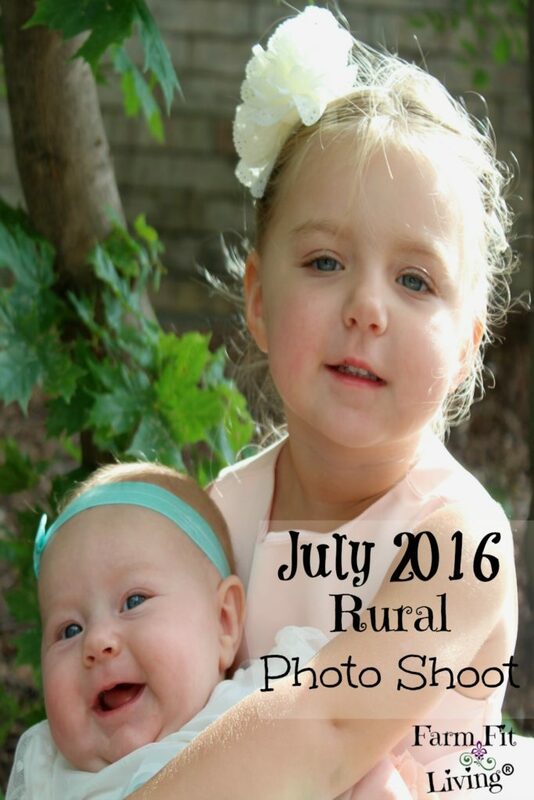 What is the July 2016 Rural Photo Shoot? If you’re reading Farm Fit Living for the first time, you may not know what the July 2016 rural photo shoot is. Well, it is a challenge. I started this challenge last month as a way to capture the growth of my girls. And also to grow in my photography skills as well. I plan to continue this challenge for many years to come as a way to collect memories with my girls. Now, I’m not just photographing them in a normal day. But I’m actually dressing them up cute like I would if I was taking them to a professional photographer. I intend to play with props and use natural lighting to capture their best moments just as a professional photographer would do. I get to use my creative brain and really think of some ideas to make the best photo work. It’s fun, I’m making memories and I’m saving money by not having to hire a professional photographer. This photo shoot is something I can plan and look forward to each and every month. It will showcase our favorite memories and events of that month. Furthermore, I encourage you to take part in this challenge as well. Why not? Well, I will tell you why I am doing it. Maybe it will entice you to try it as well. 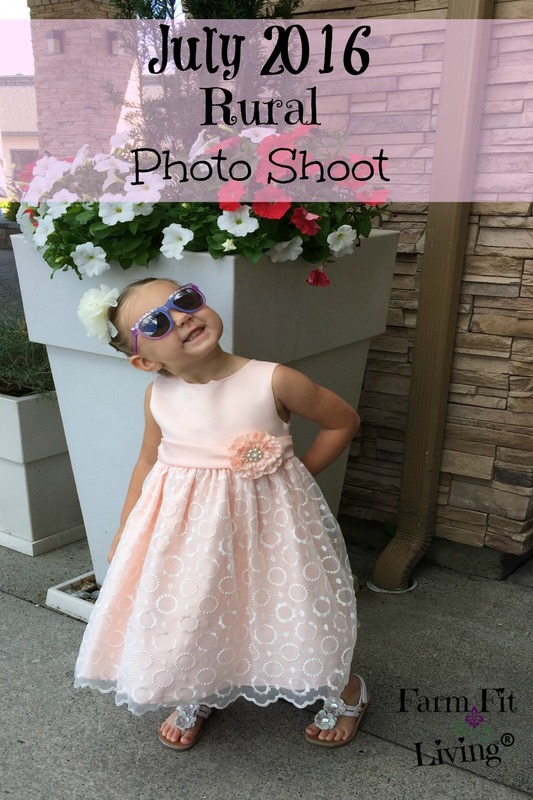 Why A Monthly Photo Shoot? Seems like it would be stressful to throw in a photo shoot in an already busy month. But, a few months ago, I was starting to believe it to be necessary. I was fighting with myself over the fact that I had not scheduled a photo shoot with a photographer after the birth of my newborn. So, I took newborn pictures of her. A month later, my mom came to visit and encouraged me to take some pictures of the girls myself. During the June 2016 rural photo shoot, I used Mylee’s Allis Chalmers peddle tractor, rocking chair and trees in our own yard for an awesome first photo shoot. That’s when the idea popped into my head. I have the cute props. I have the camera. I have the scenery. Why not? So, the monthly photo shoot challenge was born. I had so much fun with our first photo shoot in June that I decided to keep it up each month. This month’s shoot definitely had it’s challenges. I didn’t get as many photos of the girls as I would have liked. But, challenges aside, I was able to capture some beautiful photos during the July 2016 rural photo shoot. I knew this shoot would be unlike any other photo shoot because it was in a location we may never visit again. First of all, let me showcase some of these gorgeous photos of each girl. Then, I will tell you about the location and why we traveled halfway across the country for the July 2016 rural photo shoot. My big girl turned three years old last month! And she thinks she’s pretty big, too. Especially since she took her first plane ride and had her own seat, too! She had so much fun on the airplanes and did so well. Her favorite part of the air plane was the free pretzels snacks and drinks. Ahh, the simple things in life. I think so, too. I was excited that families with young children are some of the first to board the plane. We picked great seats so I could get shots like the wing. That is when we were slow descending into Spokane, Washington. Our ears were popping, but there was no way I was missing that memory. 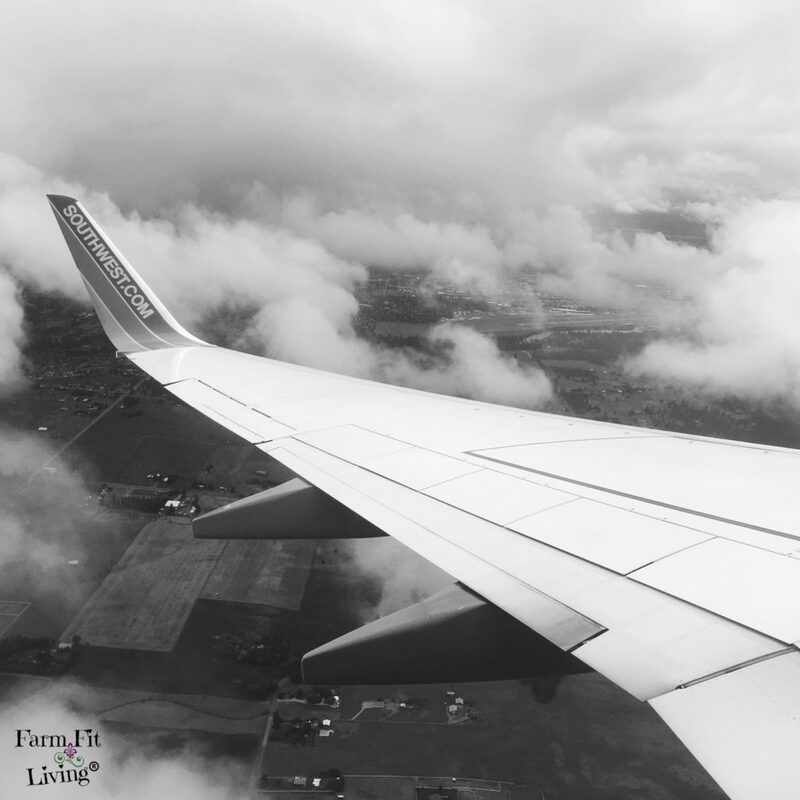 I took so many pictures of that wing sailing through the clouds and over the rural landscape. I’m showing you the best photo, in my own opinion. There were more free-range snap shots of the plane ride and airport I’m not sharing with you today. I’m just showcasing my best work and have limited space to share all the many pictures I took. And now, Mylee can remember her first plane ride thanks to the July 2016 rural photo shoot. And Maci can remember it, too. Little girl will be four months old at the end of the month. She changes so fast, so this monthly challenge is primarily because of that. And boy, did she change from last month to this month! Last month, I was trying to capture her beautiful smile. She just wasn’t ready to show it to the world yet. But, look! Here it is! Keep scrolling! I love this girl’s smile. It is contagious and brightens my day. 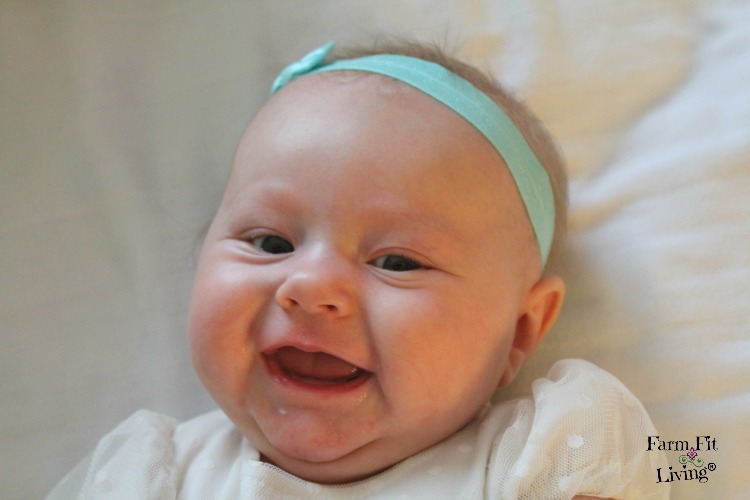 I never ever want to forget this little three-month-old smile. Little Maci also loves to blow bubbles and coo. She loves to “talk” and she demands people to listen to her. To get someone’s attention, she will stare with her big blue eyes. And if that doesn’t work, she will fuss a little bit. I was worried about her being tired and fussy for the photo shoot. But I got some great smiles out of her. As long as she had me and her sister nearby, she was the happiest baby. It just goes to show what kind of a personality she has. Maci is super cool and laid back. She has very limited needs. And she’ll tell you what those needs are: Basically to eat and sleep. I know her so well. I know her hungry cry and her sleepy cry. She’s a much easier baby than her sister was and she doesn’t have to be entertained to be happy. She can entertain herself quite easily. And, the change of new scenery was very entertaining to her. Let me share with you the scenery of rural Washington. Call me crazy. We traveled halfway across the country for the July 2016 rural photo shoot. 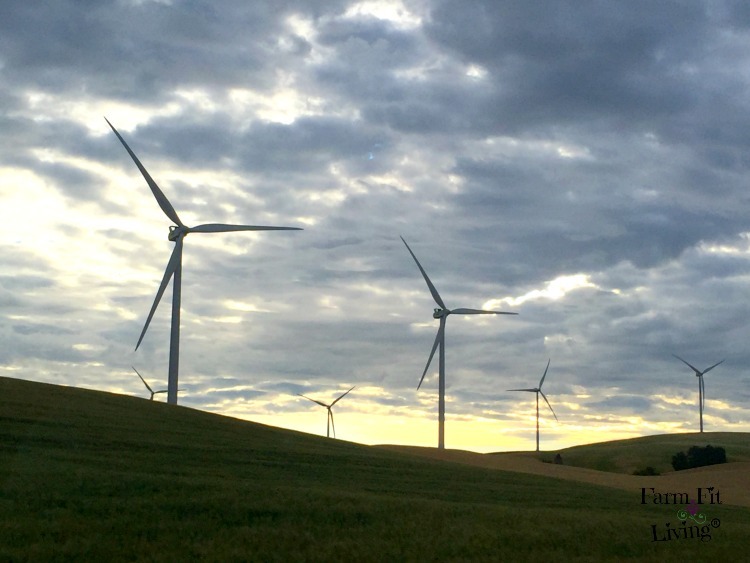 Pullman, Washington. Oh my word – I never knew there was a place so beautiful. And cool. It was the perfect summer weekend getaway from hot and humid Kansas. And since it was a weekend getaway halfway across the country, we had limited time for our photo shoot. We spent most of the time traveling by air, plus we had all the wedding festivities to take part in. But, I was determined to use this as the spot for the July 2016 rural photo shoot. I had pretty dresses for the girls. I had help (thanks, mom). And I had scenery I thought I would never see again. The truth is, I wanted the shoot to be in Washington because I don’t know if we will ever return again. Plus, it would be a different look than any other photoshoot. Oh, the memories made. So, let me tell you about the natural props and my cameras used. Using my Canon T5i, my iPhone6 and natural lighting, I attempted to capture the best quality photos I could with what I had to work with. I managed to get some indoor photos of Maci in the hotel room. Maci’s white backdrop was actually our hotel bed sheet! How do they get them so white? I also shot a few on campus of Washington State University after the wedding ceremony while we were waiting for our shuttle bus. It was difficult to find the right background on campus. I thought it would be easy, but it wasn’t. The sun was bright that day and I tried to work with it the best I could. A little too bright on their faces, but I will get better with time. I didn’t have a lot of time to move at different angles while waiting for our shuttle while on campus. 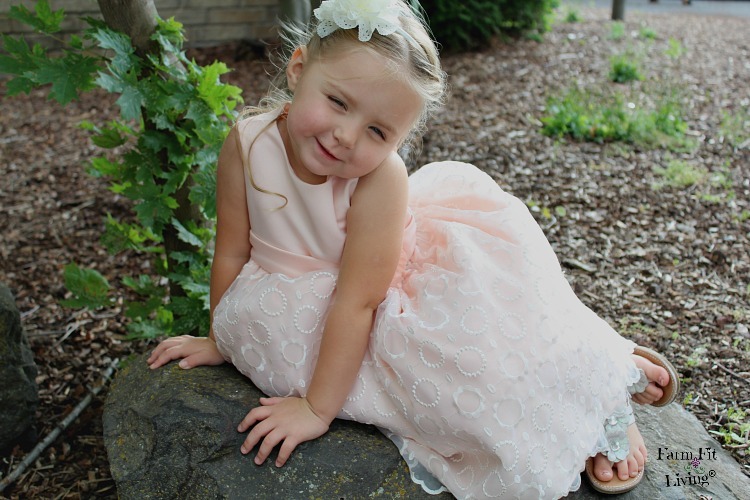 There was a nice shady spot behind the church with some big rocks that worked perfectly for Miss Mylee. I was limited on props for this photo shoot, but I made do and got some good memorable photos. I captured a few photos of my cousin’s wedding, since that was the main reason we traveled so far. My cousin Kurtis met his new bride Paige while in college at Kansas State University. Paige is from Washington state and her family farm was the location of the wedding reception. Everything was so beautiful and their family was a great host to us from Kansas. The wedding ceremony was held at the Catholic church on the campus of Washington State University. Then, we traveled out to the country to the bride’s family’s farm for a wonderful and fun country reception. 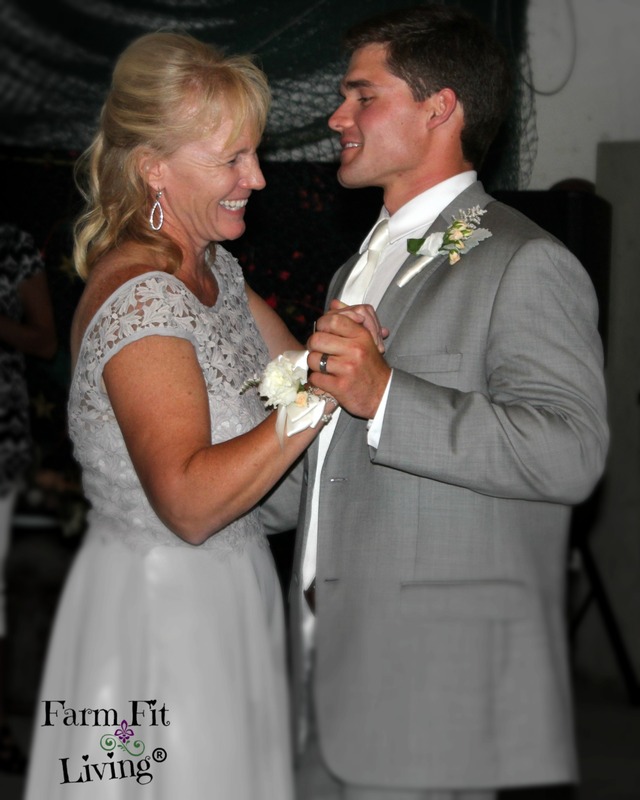 The photo below is Kurtis and his mom (my aunt Lana) dancing together during the mother-son dance. A super sweet moment captured between two special people. I tried to find some special locations for more good quality photos. Since I was halfway across the country I was out of my comfort zone. I had never been here before, so I wasn’t sure what I would find for natural backdrops. After the ceremony on campus, I found a shady spot with a large rock and trees. I captured some photos of the girls there while we were waiting for our shuttle. I literally had 10 minutes! This photo shoot did present a few challenges I learned from. Some challenges I expected but some I did not expect at all. So, we had a few challenges with the July 2016 rural photo shoot. For one thing, I wasn’t ever sure it was going to happen! Yes, jet lag was a problem. The two hour time change made us exhausted. This was a challenge for my girls mostly. They weren’t always the happiest little girls. But they were happy. They were EXCITED! Especially Mylee, who was running all over the place. It was hard to make her sit still and hold her sister for even one photo. However, even with the instant changes, the girls did great. They were really well behaved at most of the wedding festivities we attended. And there were many festivities and events crammed into the weekend. Which brings me to another July 2016 rural photo shoot challenge: Time. Time was of the essence. I literally did the outdoor shots in less than 10 minutes while we were waiting for our shuttle to take us from the church to the hotel. Finally, the third challenge of the July 2016 rural photo shoot was too much lighting from the sun. I had trouble finding optimal shady/sun spots. The spots I did find outdoors presented a little too much sunlight. But, I did my best and used what I had to work with. I still feel like I captured some great moments. While the photos of the girls are limited this month, I was still able to shoot some good ones. 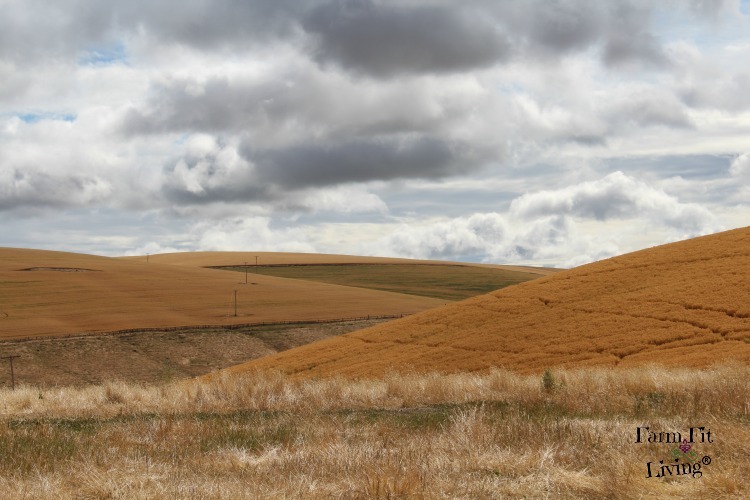 I captured way more beautiful shots of the gorgeous rural scenery of eastern Washington State. Since so many of us from Kansas attended my cousin’s wedding, the bride’s family organized a tour of rural Washington farms for us. It was a genius idea and one we were grateful for. 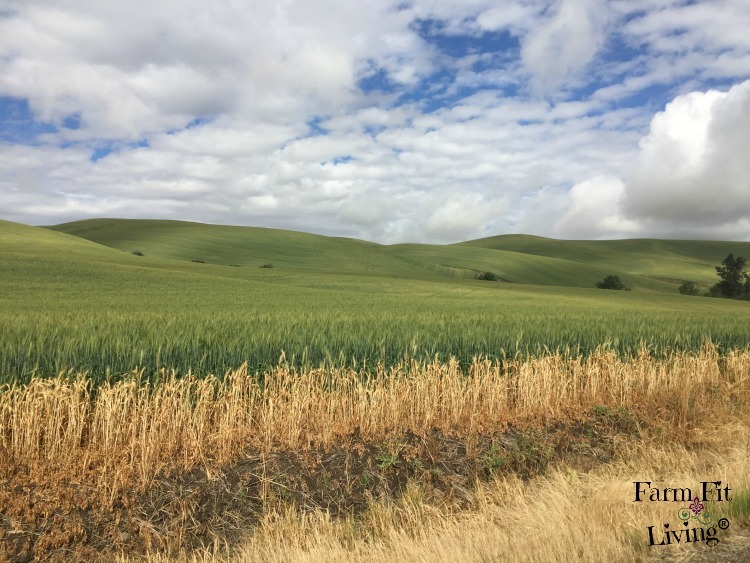 Many of our questions about agriculture and life in rural Eastern Washington were answered by our tour guides who live and work there every day. One of the biggest questions we all had for them was: “How do you farm these hills?” These hills are massive. Imagine driving a tractor or combine through these hills. They’ve been doing it since the late 1800’s. Tilting equipment and lots of care make it possible to farm the rolling hills. We saw lots of golden wheat, green peas and acres of garbanzo beans. If you like hummus, you probably know that garbanzo beans is what hummus is made from. We also got to see the Snake River from a beautiful distance. A beautiful landmark I knew of but never thought I would see. And they had one wind farm in the whole area. As we were driving back to the air port to head home, I snapped this one with my iPhone 6. Another month of summer awaits us in August with lots of photo opportunities. I haven’t decided when or where the next photo shoot will be. It could be making memories at the County Fair. Or maybe another travel opportunity will pop up unexpectedly. Nevertheless, I will find a way to capture my girls and our life in our best. I challenge you to capture your best as well. Capture your farms, your family, your pets, your livestock, whatever you’d like to capture. Share on Social Media using #august2016ruralphotoshoot. I can’t wait to see what you come up with for your photo shoots! Such cute girls! How fun for them to ride on a plane! My kids want to so badly. My son did a lot when he was younger because we lived so far from family, but he doesn’t remember any of those trips, whomp whomp. Thank you, Justine. I don’t think Maci will remember this trip. 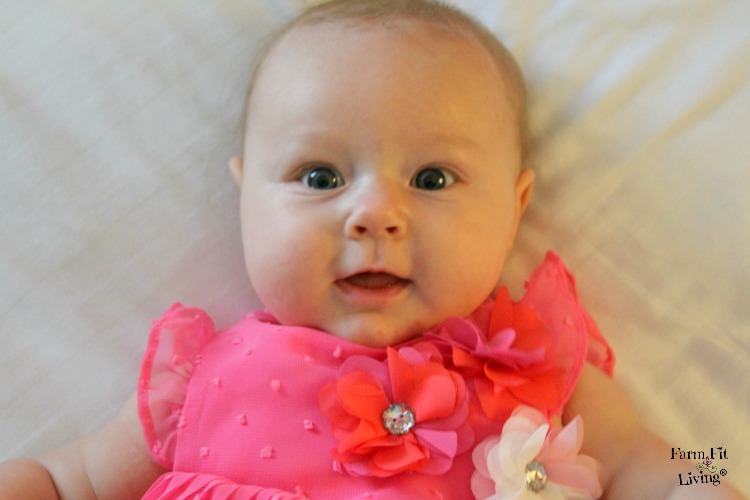 But, I was Mylee’s age when I took my first and I remember it faintly. So, she might remember it faintly, too. The pictures should help, though. It was a fun experience. Thanks for reading! Such a beautiful location for pictures! I love the big sky! Me too, Nicole! I couldn’t believe how big it seemed because I’m from Kansas and we have big skies, too. But, there, the clouds just seemed fluffier. LOL. I can’t wait to go back someday.